Twin Ring Motegi opened its doors in 1997, in the town of Motegi in eastern Tochigi prefecture. Set on hills linked to the Hakko mountain chain, Twin Ring Motegi is surrounded by forest, with the pure water of the Nakagawa river, originating on Mt. Nasu. "Twin Ring" was coined by joining the English word "twin" and the German word "ring." The name indicates the two racing courses: Super Speedway, an American-style oval course, and Road Course, a European layout. "Twin" is also intended to imply the merging of two objects, the harmony of man with nature, the meeting and joining of people. Although "ring" in German means a ring or a circle, that meaning was broadened to include a group of people, a circle of excitement and affinity. We want to make that circle of affinity and excitement even larger. That's why we call this place "Twin Ring Motegi." 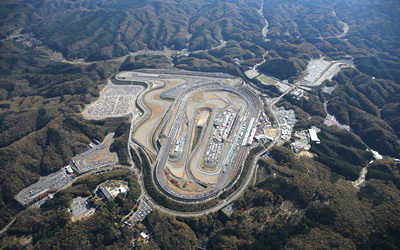 Twin Ring Motegi has a variety of racing courses. One major attraction is watching the world's top races, such as MotoGP, and feeling the speed and excitement with the whole body. The main idea in the development of Twin Ring Motegi was coexistence with nature. We aimed to keep the nearby forest as untouched as possible and leave the water system in its natural state, while reviving and increasing woodlands. Using the natural environment effectively, we have our eyes firmly fixed on the coexistence of people with nature, an attitude that will remain into future. The abundantly green Hello Woods in Twin Ring Motegi offers different displays in each season. In the rich natural asset of this forest, Satoyama (the forested village), a 21st century playground, has been built, so that children can devote themselves to play and still learn much from the plants and animals around them. Our hope is to expand and develop the circle of affinity with the completion of Satoyama. There are various types of racing courses in Twin Ring Motegi facility. Not only you can drive/ride, but also you can also feel the speed andpower with your whole body while watching MotoGP™ and other top-class races. This is one of the major attractions for spectators. About 300 vehicles such as Honda's commercial 2-wheel and 4-wheeled vehicles, general purpose products and racing machines are exhibited. You will also see the history of ASIMO the two-legged walking robot. You can learn the importance of traffic rules/manners while enjoying the opportunity to test your skills in various vehicles. It is a space for children who will be the next generation to create their own dreams manufacturing. This facility is surrounded by foothills rich in natural beauty. There is a wide variety of hands-on programs available for you to enjoy throughout the year such as playing in the woods, hand crafts, camping and forestry programs. This is a driving and riding school which is a hands-on participation type facility. We offer a program administered by experienced instructors that can meet any range of needs from beginners to professional. "HOTEL TWIN RING" was renovated to offer the best facilities for corporate and business functions. You can spend a full holiday in the airy and relaxed atmosphere that nature brings.